If we think of Calvinism these days we would probably picture images of very suppressed souls wearing tall black hats and frowning on music and dancing in the name of their beliefs. We would naturally think that it the movement was ruled by the restrictive Saturn. The founder John Calvin was a long way from that kind of character and in the middle of the 16th century when he lived he was a revolutionary figure. John Calvin had a fascinating chart. It is based around a Grand Trine in Fire signs with a Kite formation. Fire is the element of spirit, Earth being matter, Air is thought and Water is emotion. The houses in a chart can be linked to the elements of the signs. Houses 1, 5 and 9 are linked to Fire, 2, 6 and 10 to Earth, 3, 7 and 11 to Air and 4, 8 and 12 to Water. Calvin’s pattern has a double Fire emphasis as it includes the 1st, 5th and 9th houses as well as the Fire signs. The Grand Trine is centred around Mercury although it does stretch to include his Sun at the end of Cancer which makes weaker trine aspects. Mercury is the planet of thought and in Leo in the 5th house would give Calvin considerable confidence in his mental abilities allied with a strength of his convictions. Mercury is in exact trine aspect to Uranus in Aries in the 1st house. This placing creates an unconventional character who is destined to stand out from his peers, the trine to Mercury gives him a powerful intuitive faculty and an original and creative mind. The 3rd part of the Grand Trine is the conjunction of Jupiter and Pluto in Sagittarius in the 9th. Jupiter is the planet of expansion, Sagittarius the sign of exploration and the 9th house is the place of higher thinking in general and religious understanding in particular. Pluto, as regular readers will know is the planet of revolution. So to have all of this in a flowing and beneficial Grand Trine aspect is likely to create one of the most creative and original thinkers in history. The Kite formation is made by one planet that is opposite one of the Grand Trine planets and sextile ( 60 degrees ) the others. Neptune creates the Kite in opposition to Mercury. Neptune represents the search for union with God through the dissolution of the self and its this aspect that centres Calvin’s search in the religious and spiritual realms. In his youth Calvin felt a calling to the priesthood but his father Gérard pushed him in to study law because he believed his son would earn more money as a lawyer than as a priest. From 1530 to 1536 Pluto moved through the Grand Trine. Its first contact being an opposition to his Sun in Cancer in 1530 – 31. This marked the turning point that allowed everything else in his life to follow because 1531 saw the death ( Pluto opposite ) of Calvin’s father ( Sun in Cancer ). Many historians look on the period from 1531 to 1533 as being the key as this was the first time that he had been free from his father’s ‘shackles’, giving John the freedom to resume his religious studies. Consequently he left the study of law to go to the College de France in Paris to study Greek. This college was noted for its Humanistic approach to learning. He became an admirer of Erasmus. At some point between 1531 and 1533 he had a profound religious experience. “God subdued my soul to docility by a sudden conversion” was how Calvin described it. Pluto’s conjunction by transit to Neptune opposite the Sun and Mercury is how astrology would describe it. Calvin was highly critical of the abuses in the French Catholic church and at this time in France his ideas would have been heretical. King Francis I felt personally threatened by the Protestants and joined with the Sorbonne and the Parlément of Paris to hunt out heretics. Calvin fled Paris and travelled through France and Italy eventually settling in Geneva in 1536 a move that is shown in the chart by the Pluto’s conjunction with Jupiter in Sagittarius in the 9th house ( all 3 symbols ruling foreign travel ). In 1536 with Pluto exactly opposite Mercury conjunct Neptune and sextile Uranus Calvin’s “Institutes of the Christian Religion” was published. This book was a clear explanation of his religious beliefs. The really revolutionary thing about Calvinism is the doctrine of perspicuity which states that everything necessary for salvation is taught in the Scriptures plainly enough that special training is not required for interpretation. Church officers are given the authority to preach what is contained within the Scriptures, but this does not permit them to bind Christians to their own interpretation. Christians are to compare interpretations with one another, but they are always free to personally interpret Scripture. The authority of the Church of Rome and the priesthood was thrown out of the window and in May 1536 Geneva adopted religious reform, the monasteries were dissolved, mass was abolished and papal authority renounced. Calvin’s church services were plain and simple. He placed great importance on the sermon. Though he himself liked music, he distrusted its use in religious services believing that it distracted people from the matter in hand – the worship and the seeking knowledge of God so musical instruments were banned from churches. Calvinism was based around the absolute power and supremacy of God. Calvin believed that Man was sinful and could only approach God through faith in Christ – not through Mass and pilgrimages. In Calvin’s view, God predestined some souls for eternal salvation while the others would suffer everlasting damnation. God has chosen to show mercy to some, not all. In many ways that are quite fitting with someone with Uranus rising, Calvin’s legacy was political as much as religious and his concept of God and man contained strong elements of freedom that were gradually put into practice after his death, in particular in the fields of politics and society. The Netherlands, under Calvinist leadership, became, the freest country in Europe and a safe haven for many great revolutionary thinkers, including Spinoza and Descartes. Calvin was the first prominent philosopher who demanded tolerance for atheists. The rise of democracy in England and North America owed much to Calvin who included elected laymen in his concept of church government. He appreciated the advantages of democracy and favoured a mixture of democracy and aristocracy as the best form of government. The aim of his political thought was to safeguard the rights and freedoms of ordinary men and women. In order to minimize the misuse of political power he suggested dividing it among several institutions in a system of checks and balances (separation of powers) that became the cornerstone of the US constitution. Calvin taught that if worldly rulers rise up against God they should be put down. In this way, he and his followers stood in the vanguard of resistance to political absolutism and furthered the cause of democracy. The Congregationalists who founded Plymouth Colony and Massachusetts Bay Colony were convinced that the democratic form of government was the will of God. Of course the planets that formed John Calvin’s Grand Trine, Uranus, Neptune and Pluto had not been discovered at the time of his life. Capricorn Research’s view of this is that these planets would still have an impact even though they were unknown. After all man’s relative ignorance of astrology hasn’t stopped it having a major effect on human behaviour. An interesting thing about these three planets is their full impact in the lives of people doesn’t always become clear until after their death. The role of Henry VIII in the English Reformation is a example of this. In Calvin’s case, one could argue that the true impact and legacy of his life and beliefs did not really come to fruition until the US Declaration of Independence and the setting up of the American constitution, the early days of the USA coinciding with the discovery of Uranus. Where would astrology stand on something like predestination ? Any discussion of religious issues is always complicated because of the commonly held view that heaven is a place that only exists after death. Religious experience is of the present moment but belief invariably brings in the future and so the grace of God is something that only becomes available after one is dead. Religious belief changes things because of man’s inability to stay in the present moment. If we step away from belief in the future and see that it is possible to experience something of the grace of God whilst we are still alive, then it is perhaps easier to understand Calvin’s views on predestination. Astrology would say that we are all given free will to choose how to use the birth charts that we are given. But it is also clear that some people’s charts may make it easier for them to experience grace than others. 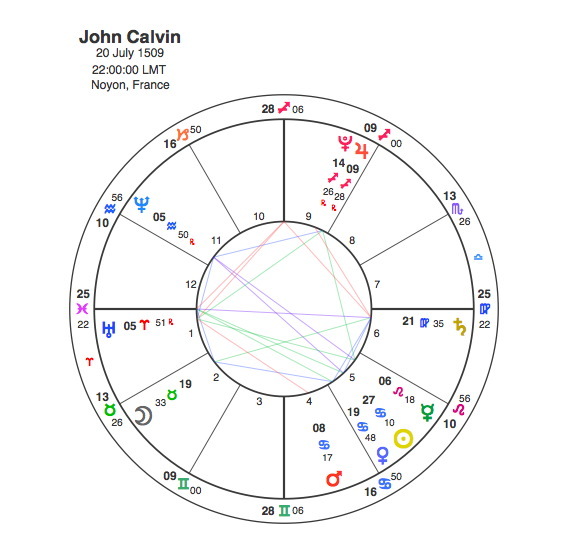 If like John Calvin, you had a Grand Trine in Fire signs with a Kite formation including Jupiter, Uranus, Neptune and Pluto you would probably be one of those lucky people. else recognise such unique approximately my problem.